"There is something about Wesley Korir that Fred Whitehouse and his University of Louisville properties maintenance crew noted almost immediately: 'The positive feeling that he gave us all.' "
- Selection from Katya Cengel's article from The Courier-Journal on Kenyan Wesley Korir. In 2010 we at LetsRun.com hope to make a huge push to talking more about training. Seems likely they're not going to allow Semenya to compete in female races unless she gets some sort of operation. The IAAF are willing to pay for the expense of a surgery. Kiyoko Shimahara Returns To Honolulu Marathon As Favorite To Win Again Shimahara's 4th marathon of '09 doesn't mean her others have lacked quality. She ran 2:25 to win Hokkaido and 2:28 to beat Catherine Ndereba at Yokohama. Japanese 27:41 10k'er Announces Intent To Race Marathon In February Yu Mitsuya ran 27:41 as a 20-year-old. This is the first time in Olympic history a gold medal will not be awarded in an event. Victor Conte Talks With Track Journalist Duncan Mackay About Marion Jones Refusing To Come Clean Fellow Ex-Prisoner Victor Conte On Marion Jones: "Marion knowingly used drugs and I'm sure she knows it was a mistake. But, I believe Marion is continuing to make a mistake by not coming forward with the entire truth." 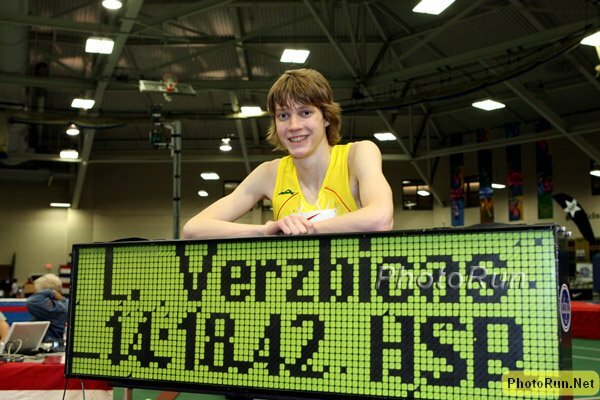 *Lukas Verzbicas Profile Leading Up To Foot Locker Champs This Weekend That photo to the left comes from Verzbicas' freshman year in high school. The girls race will bring 4 undefeated girls from 4 different regions together. Megan Goethals, Aisling Cuffe, Chelsea Sveinsson and Molly Grabill are the "Big-4". LetsRun.com voters like lightly-raced Sveinsson over course record smashing Cuffe (34%-30%) while Grabill is basically running on her home turf and Goethals is the top returner from 2008 AND is the only senior. Arizona's Ken Cormier became the surprise 2004 FL Finals champ before going to Arkansas and becoming an XC All-American. But somewhere, things didn't feel right and Cormier went home and decided to enlist in the Marines. After serving the US in Afghanistan, Cormier is back and talked to Dye Stat ESPN RISE writer Dave Devine, who wrote a great piece about the guy who went from 73rd in his FL region to the National Champion. IAAF Preview Of European Cross Country Championships on Sunday Ukraine's 34-year-old Sergey Lebid has made his career as an excellent cross-country runner. He has won 8 European titles and will contend with Britain's Mo Farah and host Ireland's Martin Fagan and Alistair Cragg. British Selection Procedure For Euros Getting Hammered By Some Last week an LRC reader emailed us and we wrote an article about why the British fiasco is proof the US system of "first across the line" is the fairest despite flaws. Mo Farah Article Leading In To European Cross Nobody's questioning this guy being on the GBR team as he's almost certainly going to be top-3 in the race. 3-Time Junior Champion Steph Twell Moves Up To Under-23 Race At Euros Twell ran 4:03 this summer and is a sort of British child prodigy who gets to bear all the pressure of expectations. New British Coach Dan Pfaff (Hired Away From USA) Urges Top Athletes To Avoid Injuries He cites a laundry list of top British athletes who have missed big events in the past few years and urges coaches to mix up the training. Collis Birmingham Takes Narrow Win at the Zatopek:10, Aussie 10,000m Champs 5 women finished between 32:19 and 32:29. Last year's Zatopek champ and NCAA star David McNeill suffered from a side stitch and faded during the last 2k as Birmingham ran 28:04 ftw. After earning an Olympic Bronze and snagging every American record she can on the track, Shalane Flanagan has said she is looking for a new challenge. The first step comes January at the Houston Half. Korir's story is absolutely incredible. He finished 3rd in the Chicago Marathon in 2008 and then did the impossible by winning L.A. in 2:08, taking home $160,000 in the process. This story is about his life in Louisville working as a handyman fixing toilets and sinks and things and even has a picture of the new house he bought. "Back in 2000, there was no independent anti-doping federation in place for several of the countries which have female athletes that will now receive medal upgrades... Back then, it was very easy to circumvent the drug testing procedures." We're not saying every sprinter in 2000 was on drugs but WADA and the IOC did not have strong policies in place that affected every country back in 2000. This is the first time in Olympic history a gold medal will not be awarded in an event, as the tainted top-2 Marion Jones and Katerina Thanou and their greedy coaches, doctors and managers have attempted to make a mockery of sport in their careers.